Today we're continuing to show what you can do with Paula Nadelstern's Wonderlust fabric. 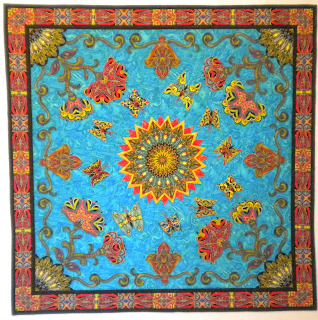 We're starting out with a virtual trunk show of quilts made by Paula and some of her quilting friends. Keep scrolling through the trunk show to find a sneak peek at today's blog hop tutorial by Sandra Walker of mmm Quilts! 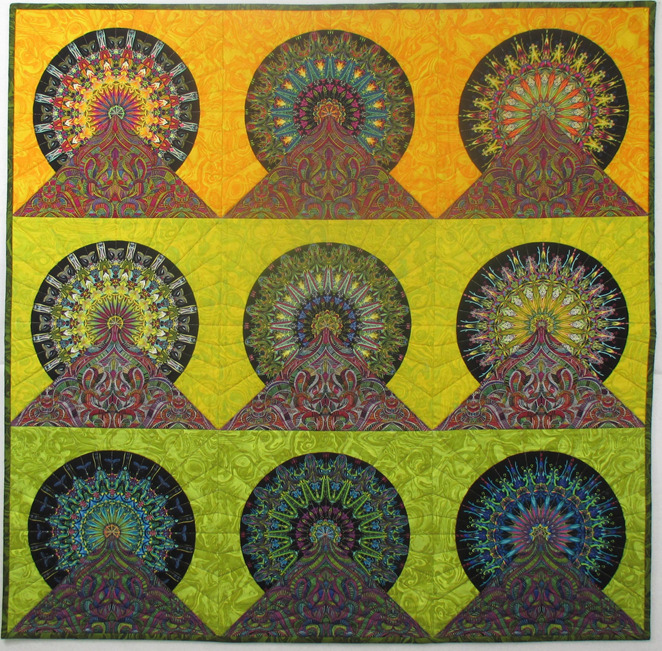 "Thumbnails" designed and sewn by Paula Nadelstern. 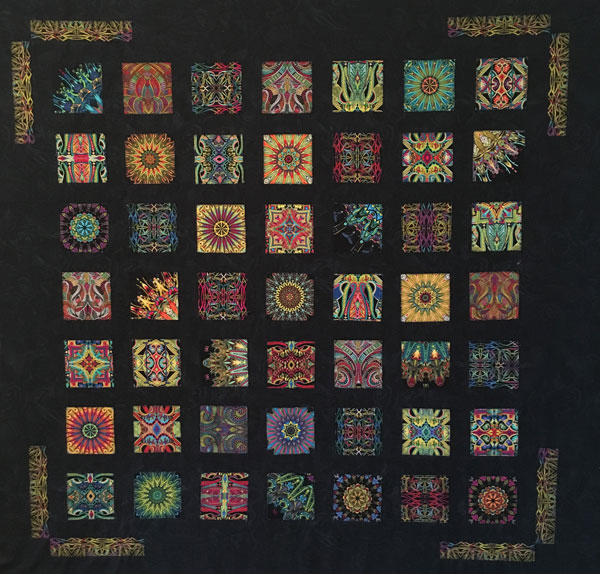 "I made this quilt, THUMBNAILS, to showcase little vignettes of perfect pattern from the 12 fabrics in my new WONDERLUST collection. This 36” square quilt is really different for me. I'm a piecer and had to learn how to fuse and machine applique. 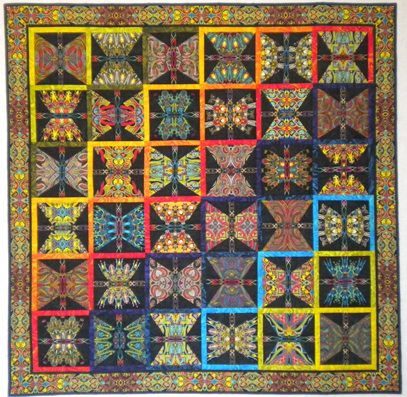 3” square motifs and 1 ¼” space between squares. Note the corner treatment. 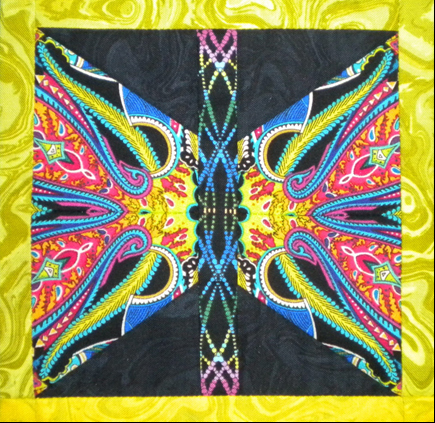 Fused and machine appliqued to whole cloth piece of Marbella Black. I made a 3” square from see-through Visigrid with the sewing lines, than marked a quarter of an inch seam allowance so I knew which portion of the pattern would be in the final 3” square." How much fun would it be to fussy cut all these squares! 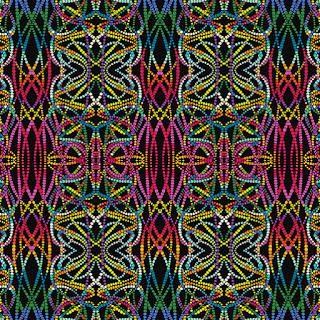 So many great motifs to choose from. 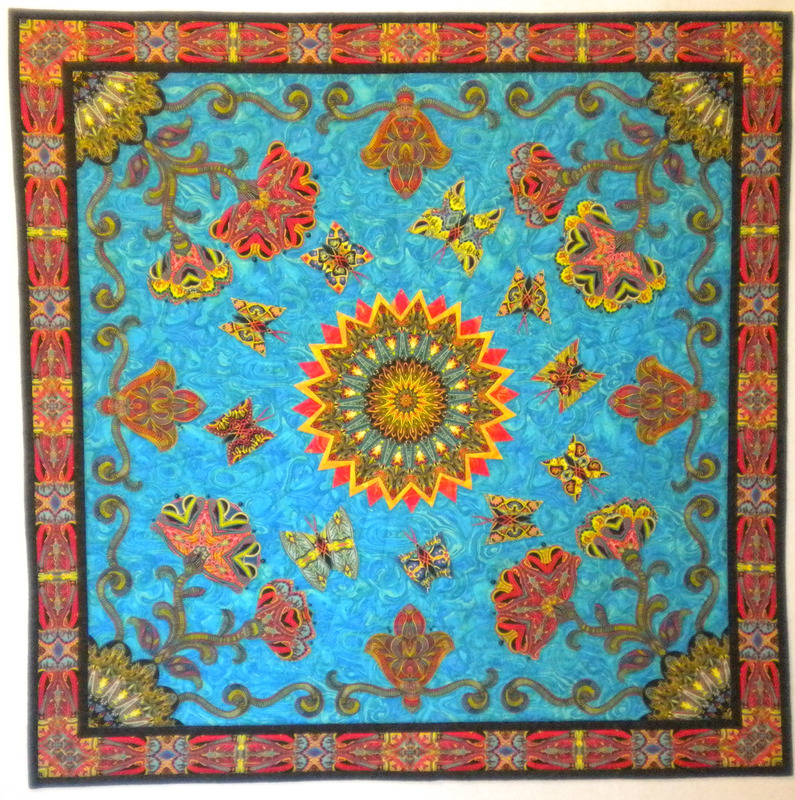 With the light blue background, this quilt looks completely different from the quilts with black backgrounds! Fussy-cut butterfly wings made from the various prints in the collection. 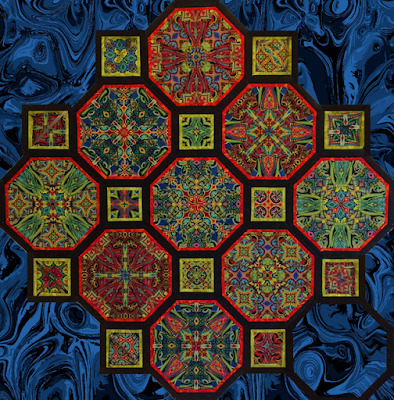 Gorgeous hexagon blocks outlined in black and red on a rich dark blue Marbella background. 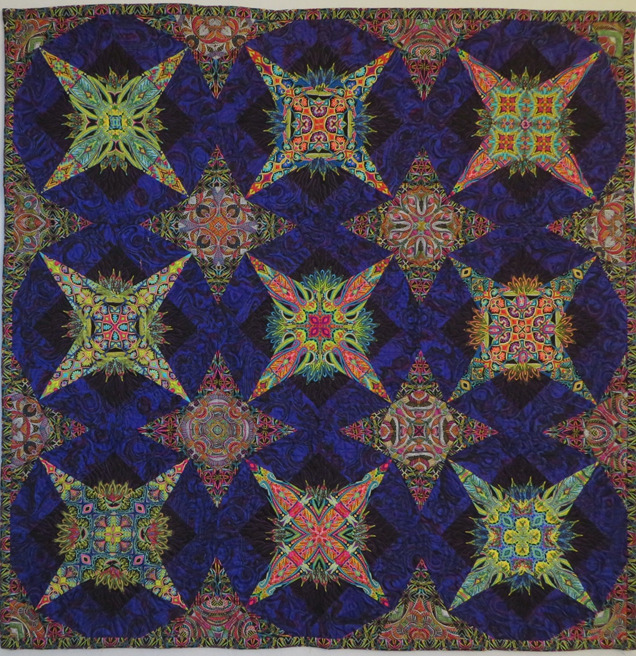 There are so many different kaleidoscopes to look at in this quilt! 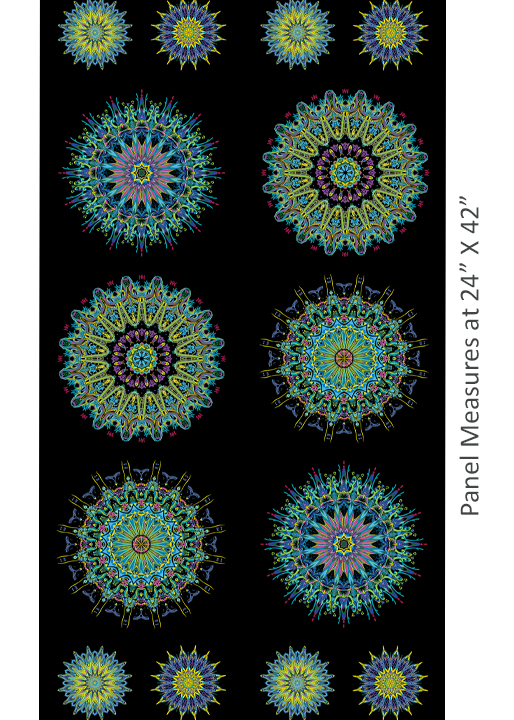 A Moon Over Mountain design with varying fussy-cut moons and three different background colors. A classic Lone Star that sparkles with red and orange Marbella. Our Wonderlust blog hop this week features four different projects by four different designers. Follow along to see where their inspiration led them, and find out how you can enter to win a bundle of Wonderlust prints. 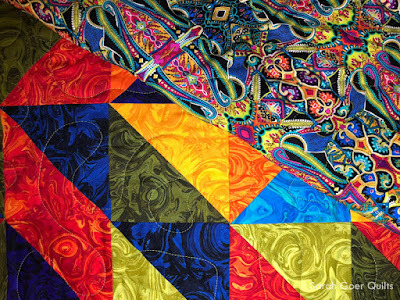 Today Sandra from mmm Quilts is here sharing her kaleidoscope version of the Tapestry print. She's made it into a stunning pillow. Head over to her blog to see how she did it and find out how you can win a bundle of Wonderlust fabrics. 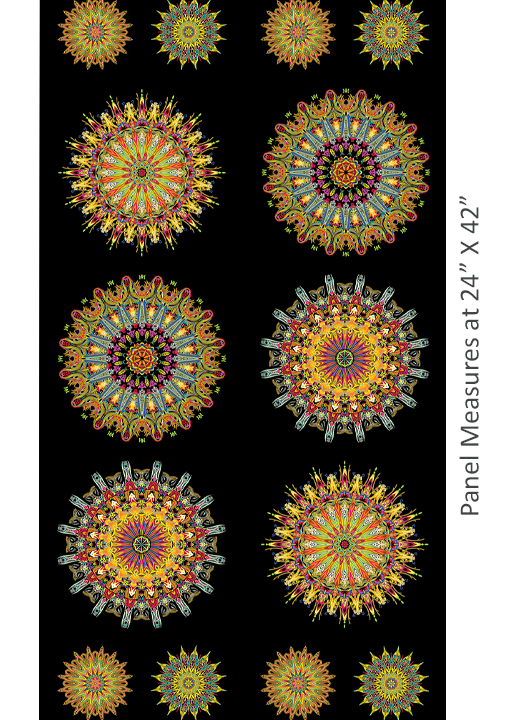 When I saw Paula Nadelstern’s new line of fabric, Wonderlust, as a choice for an upcoming blog hop for Benartex I was ecstatic. 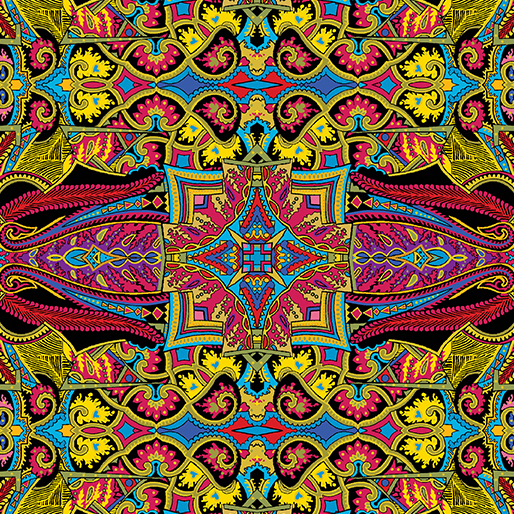 I knew immediately that I’d use it for kaleidoscopes. 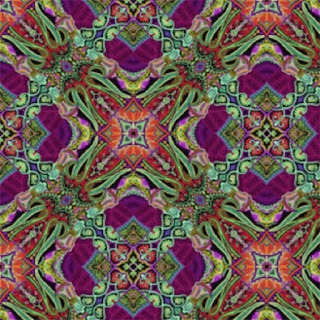 What these kaleidoscopes would grow up to be I wasn’t sure, but fabric this delicious could be nothing else in my world. Be sure to follow along for all 4 days of our Wonderlust blog hop! 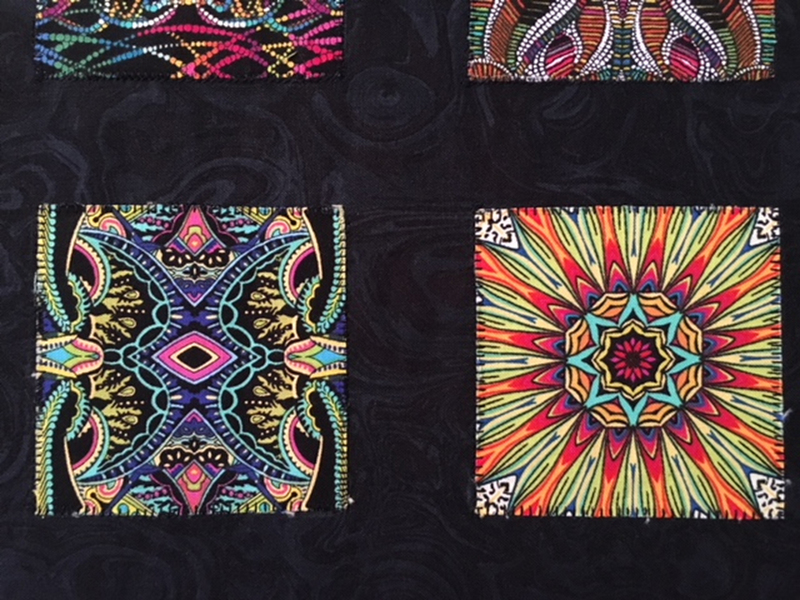 Click here to see more of the Wonderlust collection and read an interview with Paula. 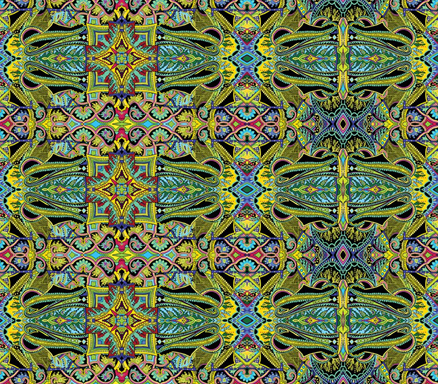 Click here to see the entire Wonderlust collection. Click here to visit Paula's website. 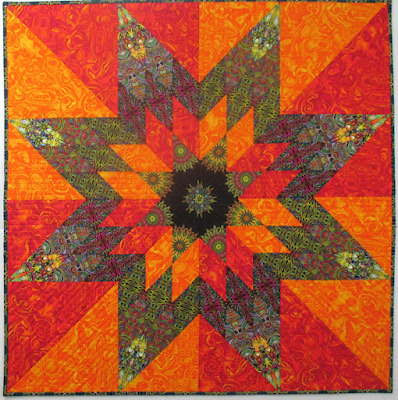 Today Sarah from Sarah Goer Quilts is sharing a quilt she made using the Marbella blenders from Wonderlust. 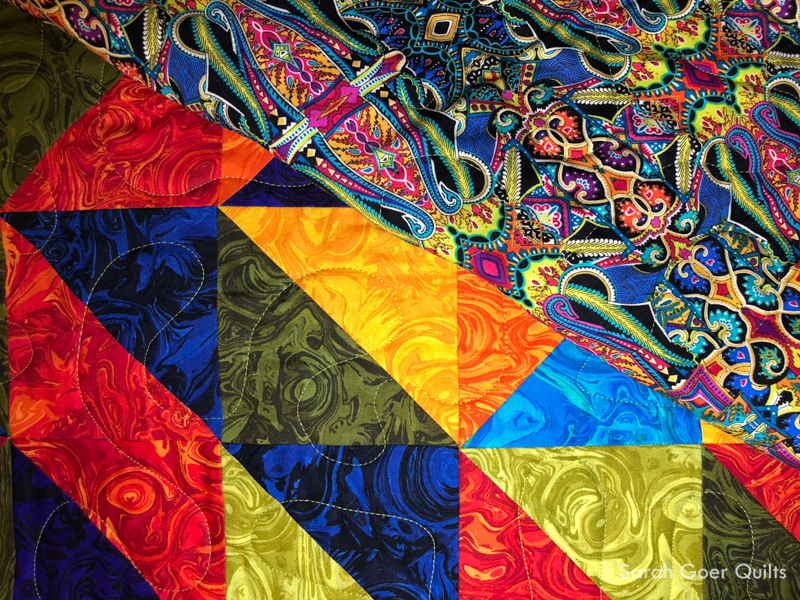 The bold colors of the Marbella print stand alone in a simple yet graphic design, and then Sarah used the Tapestry print on the back to tie the whole quilt together. 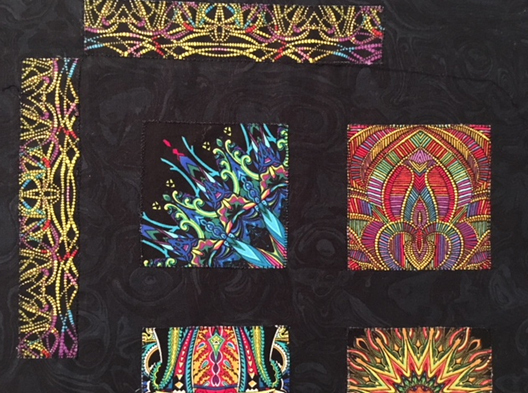 Head over to Sarah's blog to see her tutorial, more photos of the quilt, and find out how you can enter to win a bundle of Wonderlust. 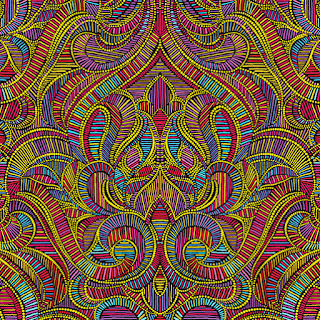 I love a good blender fabric and was immediately drawn to the luscious Marbella prints in Paula's Wonderlust line. 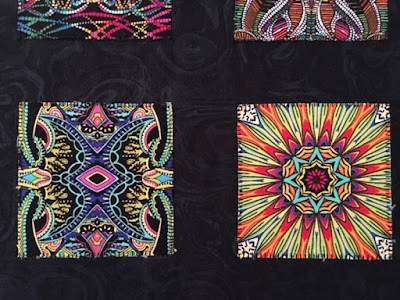 I chose to feature an assortment of these blenders in a rainbow of color for a HST baby quilt, complemented by Paula's beautiful multicolored Tapestry print as my quilt back. These happy colors were a joy to work with. Hop on over to to my blog for the full reveal of my Wonderlust baby quilt and my tutorial to create one of your own! When you see these kaleidoscopes, you'll know immediately whose fabric we're sharing today! That's right, Paula Nadelstern's new collection, Wonderlust, is now available in stores. 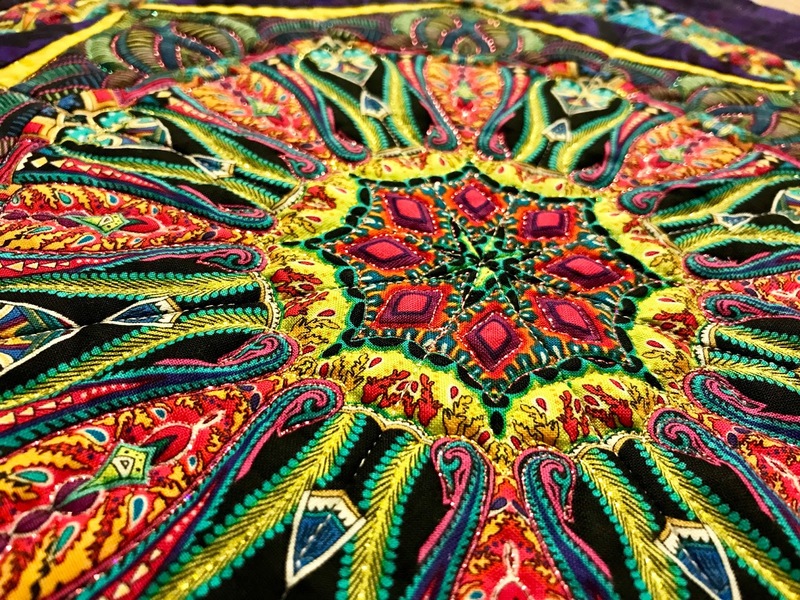 Get ready to drool as you scroll through images of the kaleidoscope panels, the coordinates, and quilts made using the Wonderlust prints. 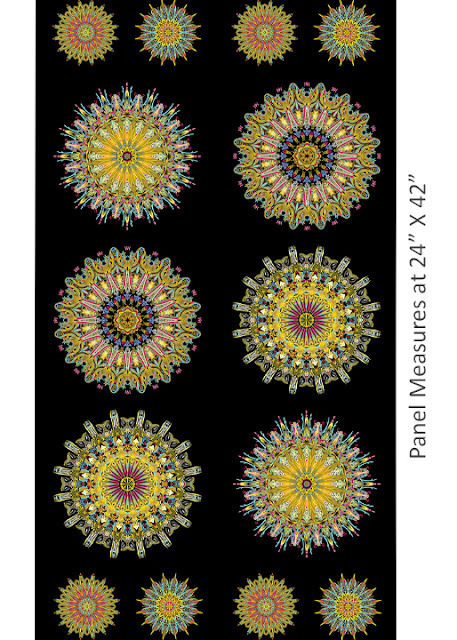 Each panel includes six larger kaleidoscopes and eight smaller ones, perfect for fussy cutting. 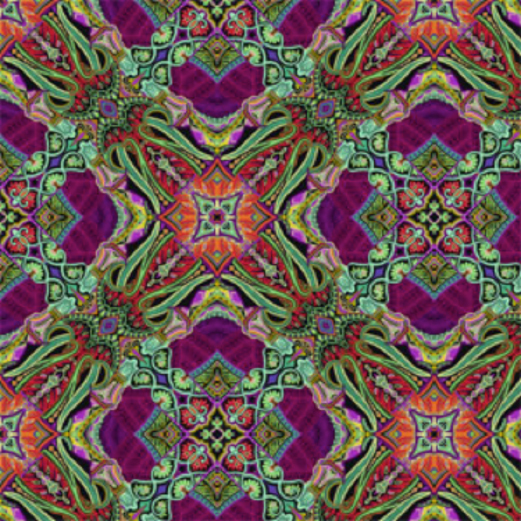 Three different kaleidosocope-inspired prints, plus the gorgeous, flowy Marbella print in 10 different colors! Where did the Wonderlust name come from? 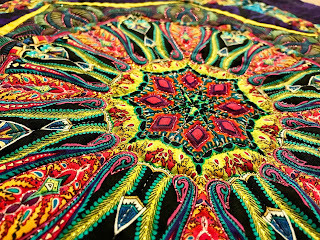 When it comes to fabric, I’ve got a serious case of wonderlust: I marvel at beautiful, extraordinarily patterned textiles, the kind that makes me wonder what I can do with it. I’m in my happy place when I’m nudging seemingly mutually exclusive designs into agreement, finding the junction where patterns dovetail. Being a maker has always been an irresistible precept because I crave the addictive, satisfying payoff when a vague idea becomes a solid product that can be shared with fellow makers. 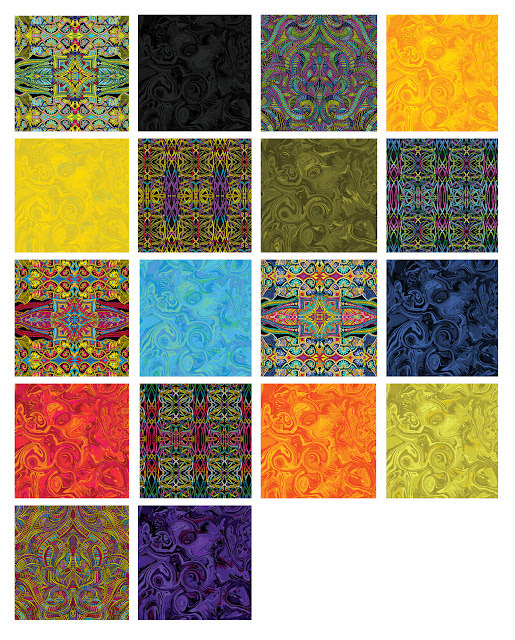 Where do you find inspiration for all of your fantastic prints? In many different places, but here's a great example of inspiration. 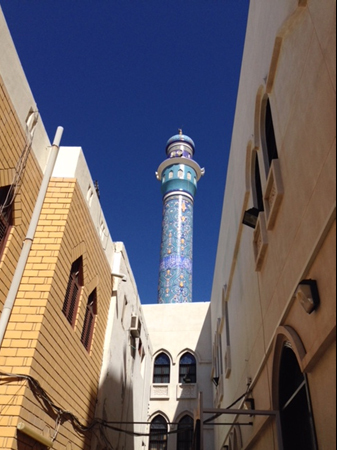 In February 2016, I visited Muscot, Oman with Sue Nickels and Nancy Prince before we taught in Dubai. When I saw this beautiful yellow spire against a perfect turquoise sky, I decided I'd use those colors to inform my next collection. 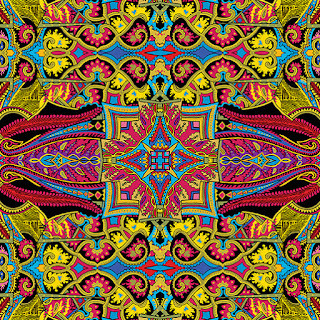 Here's the Blue/Multi Tapestry print, inspired by the photo. Can you tell us about some of the prints? 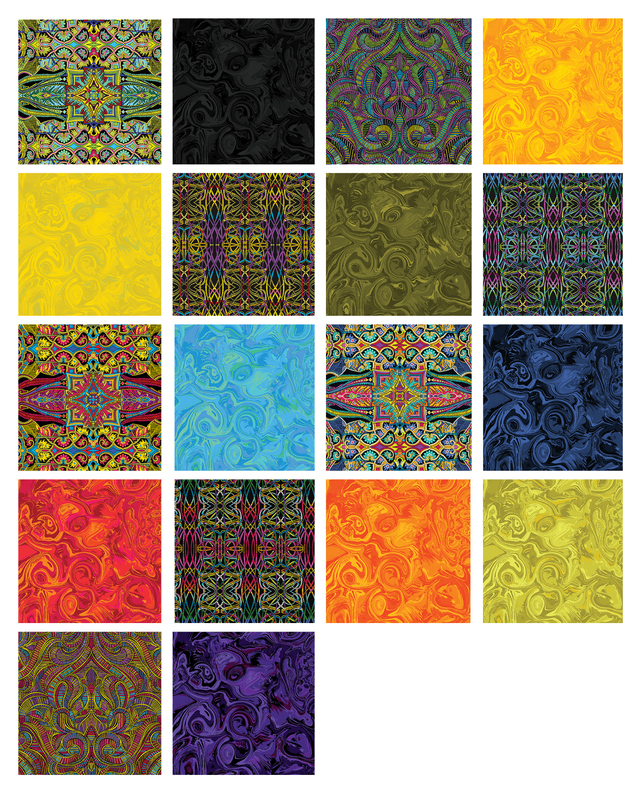 There are four patterns in three color ways: Multi, Blue Multi and Olive Multi. Three are bilaterally symmetrical patterns with mirror images. 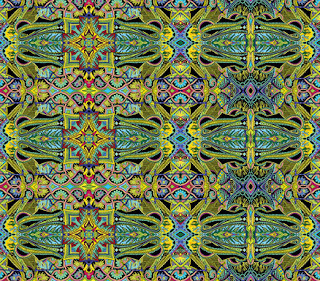 Tapestry is a variation of an older pattern called Tile from NUANCE, my 2009 collection. I’m finding it deeply satisfying to tweak artwork from previous collections. Electric Slide is a cleverly plotted dot print guaranteed to slide the eye smoothly in any direction you want. 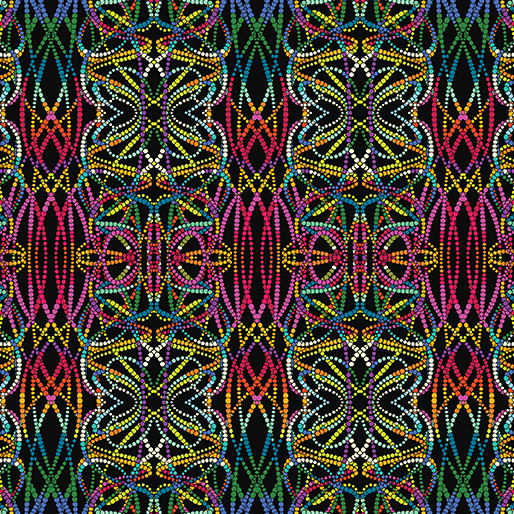 Try it in sashing and borders. 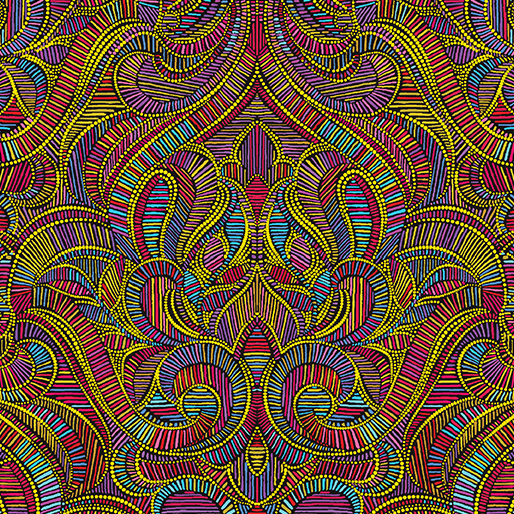 Good Vibrations is a compelling pattern of organized dashes which always create animated pulsating texture. Cut symmetrically or randomly. TIP: It makes great binding. The Super Kaleiders panel prints have a background story. 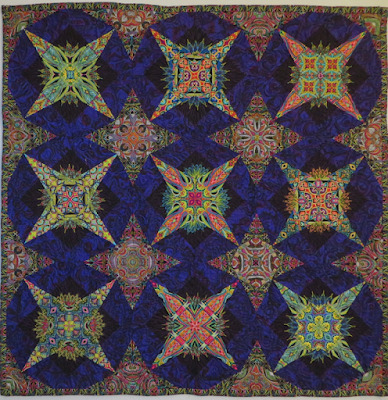 They are reproductions of three of the twelve 20” square kaleidoscopic I made for my exhibition KALEIDOSCOPE QUILTS: The Art of Paula Nadelstern at the Museum of American Folk Art, NYC, spring and summer 2009. 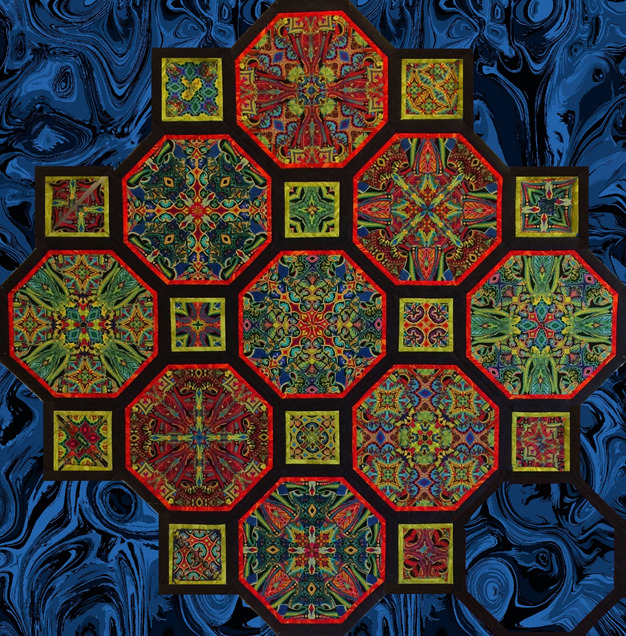 The twelve blocks were framed and mounted in a single installation titled KALEIDOSCOPIC XXXIV: The Never-Ending Kaleidoscope. The ten Marbella colorways are allovers that read-like-solids, filled with tones and shades creating nuanced and textural surfaces instead of flat empty spaces. 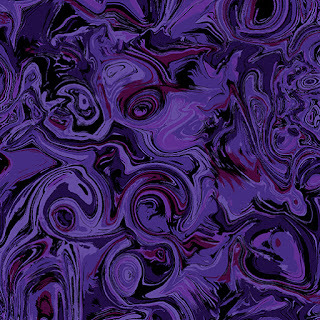 The Black fills my specific definition of an excellent black: a tone on tone with a perceptible but not overwhelming pattern and the Navy and Purple are gorgeous. By now you may be asking yourself, what can I make with Wonderlust? We've got answers! 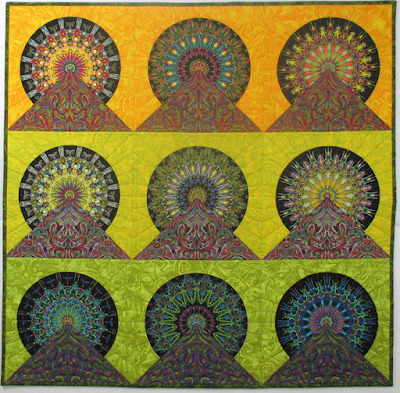 We'll be sharing a virtual trunk show of quilts made by Paula and some of her friends later this week, and we'll also be hosting a blog hop showing project ideas using these fantastic fabrics Tuesday through Friday. Come back and visit us! Looking for a Tropical Boost? We have one!